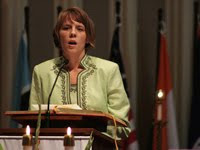 In August 2007, as Paris prepared for her first vow ceremony with the Sisters of Charity of Nazareth, she recognized the small voice in her heart had slowly transformed into the calling of a lifetime. A call to enter religious life, a life dedicated to service and mission. So what has the journey been like for Paris, a young woman in search of her true calling? It began in Alabama, as Paris, the youngest of four in her family, decided to go on a pilgrimage at the age of 14. She recalls this as the first step in her spiritual and emotional development. She began searching. The thought of religious life hadn’t yet entered her mind. Paris dreamt of a family of her own, of being the mother of six children and a wife. And when she did begin to think of being part of a community of women religious, her mind filled with stereotypes – stereotypes she had to let go of. Her mentors throughout this process helped her see that there was nothing wrong with the struggle she was experiencing, that “true discernment happened between two goods,” and she just had to follow the stronger call.